Maestro Girsh, originally from St. Petersburg, Russia, has had an international career working with youth and radio-television symphony orchestras. As a concert performer and teacher, he received his bachelor’s degree and professional diploma from Glinka Music College, his master’s degree in conducting from Glinka Conservatory and Ph.D in opera and symphony conducting from Moussorgsky Conservatory. Girsh aspires to continue a chamber music group for musicians who want to play solos, duets, trios or quartet music. 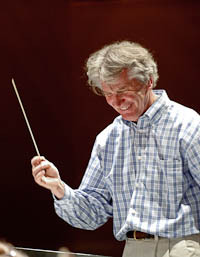 In addition, to teaching orchestration, conducting and composition, he often guest conducts all over the Pacific Northwest including the Mahler Northwest Festival. He is the founder and artistic director of the Concert Opera of Seattle, Music Director of the Eastside Symphony and Conductor of the Boeing Concert Band.